In an article published in August 2018 in the journal Nature , the CLAS collaboration of Jefferson Lab (USA) reports an extensive study on short-range correlations between nucleons in different nuclei. The conclusion goes against intuition, indicating that the greater the ratio of neutrons to protons in a nucleus, the greater the speed of protons relative to neutrons. These very fast protons could be a key to understanding the formation of ultra-rich neutron systems like neutron stars and their coalescence first observed a year ago. This phenomenon is all the more important as it could contribute to the creation of the heavy elements of the universe. Figure 1: Diffusion of an electron on a nucleus. 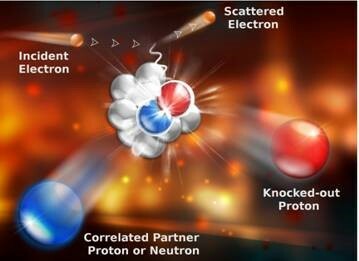 The CLAS spectrometer detects the whole final state: scattered electron and pair of nucleons. The CLAS international collaboration brings together 200 physicists in more than 40 institutes in 9 countries, including a team of 7 DPhN physicists. It used a high acceptance spectrometer called CLAS from 1998 to 2012, which since the end of 2017, became CLAS12 following important technical improvements, to which Irfu contributed via an innovative central tracker using cylindrical Micromegas. The data used in the analysis of this Nature article are derived from a recent re-analysis of data taken in 2004, thus demonstrating the importance of adequate data management over time for these major collaborations. The CLAS spectrometer collected electron scattering data on targets such as carbon, aluminium, iron and lead 14 years ago, thus allowing the number of protons and neutrons in the probed nuclei to vary relatively, with carbon being symmetric and lead having about 50% more neutrons than protons. The high acceptance of the CLAS spectrometer made it possible to detect events with a scattered electron and a pair of nucleons, and to measure their speed or momentum. The process under investigation is shown in Figure 1. Figure 2: Fraction of nucleons with a high pulse as a function of neutron excess. In red the protons, in blue the neutrons. The result is striking, as shown in Figure 2: by going from carbon to lead, the number of high-momentum protons increases by about 50%, while the number of high-momentum neutrons decreases by 10%. 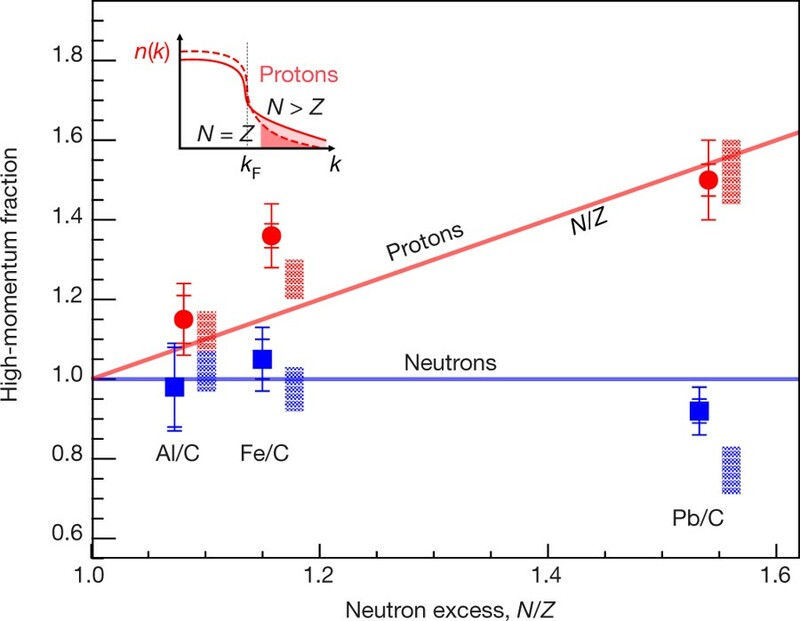 As the neutron-to-proton ratio (N/Z) increases, a larger fraction of protons are "led" by the neutrons at high momentum. These high-momentum protons could prove crucial for understanding neutron stars, whose neutron numbers are far greater than the number of protons. Indeed, the momentum distribution of neutrons and protons in these stars affects their cooling process and their equation of state especially in the outer layer of the star. Moreover, a modification of the equation of state and more particularly its symmetry term could have an influence on the merging of neutron stars, a phenomenon which first detected by LIGO/VIRGO a year ago, and which might be responsible for the creation of elements heavier than iron in the universe. A major experimental program led by Irfu and funded by the ANR (Cocotier) is being developed to go even further in this study. Indeed, in CLAS data, the neutron/proton ratio changes for each studied nucleus, but the very nature of the nucleus changes and notably its mass and size, making theoretical interpretation more delicate. Our Cocotier project owes its originality to the use of carbon isotopes in inverse kinematics at GSI (Germany), thus making it possible to vary the neutron to proton ratio (between 0.6 and 3) in a nucleus of the same nature and to carry out this study in a more precise and controlled manner. Data taking for this experiment using the R3B GLAD magnet delivered in 2015 to GSI - an Irfu realization for FAIR - could happen as soon as mid-2019.